The streamline styling of the new Giro Synthe definitely caught my eye. The design and styling is that of a high end sports car. I’ve heard that with this aero style helmet, it potentially could shave time off of your rides, races, or TT’s. Once I properly adjusted the straps for my head, the Giro Synthe was a helmet that felt like it was designed specifically for me. The aero venting provided more airflow than I have ever had with a helmet. With a quick turn of my head, the side ports allowed for maximum airflow to enter the side of my helmet. A quick turn of my head left to right, provided cool air to cascade over my entire head. At no point during my 40 mile ride did I feel any discomfort from this helmet. As mentioned before, the fit felt like it was customized specifically for me. Inside the helmet I found slender plastic ribbing that contours to the top of your head. This ribbing provided flexibility to essentially ensure that the helmet floats on your head. This gave me the sense that the helmet isn’t sitting directly on my head. I feel that this also contributed to maximum airflow. Unlike the Smith Overtake, at no point during the ride did I feel that the helmet was too hot. The weather and riding conditions were about the same, which gave me a close comparison. The forehead padding provided adequate absorption to prevent sweat from dripping down my face. As for the aero design, without comparing two identical rides with the same riding conditions, it’s hard to say for sure how it performs. What I can say it while on my test ride, and hitting speeds of 40+ mph, I definitely felt like I was going faster. There seemed to be less wind resistance, which in turn felt like there was less strain on my neck muscles. 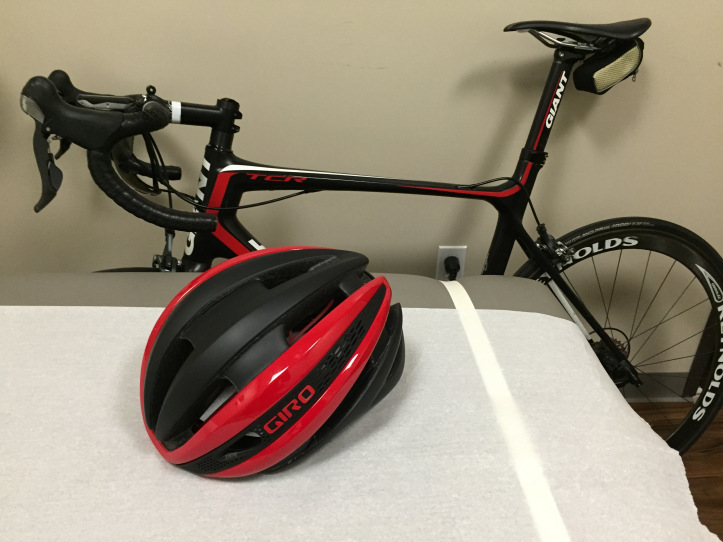 I have no doubt that when looking to shave time off of a ride, the Giro Synthe is the everyday road cycling helmet to use. This helmet, hands down has been the most enjoyable helmet I have ever used. It definitely would make its way into my collection.